Welcome to the Bournemouth Chess Club. If you want to polish up your game, spend an afternoon discussing opening gambits, or are a complete beginner, we are the club for you. We meet at the Kinson Community Centre, on the first and third Monday of every month (excluding bank holidays) from 2pm til 4.30pm. During league matches the club is also open for members to play friendly games and you can arrive from 6.30pm. Home matches are normally scheduled on a Tuesday, starting at 7.15pm. The club's opening dates for 2018-19. 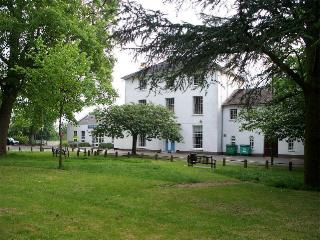 Kinson Community Centre is a Grade II listed building, surrounded by the award-winning Pelhams Park. There is ample parking available. We have two teams which compete in the Bournemouth and District Chess League B&DCL. Places are available for league matches, so sign up now for this season.